Adult Forum is an opportunity for adults (teens are welcome too!) at St. Mark to enjoy lectures on a variety of topics for learning and enrichment. 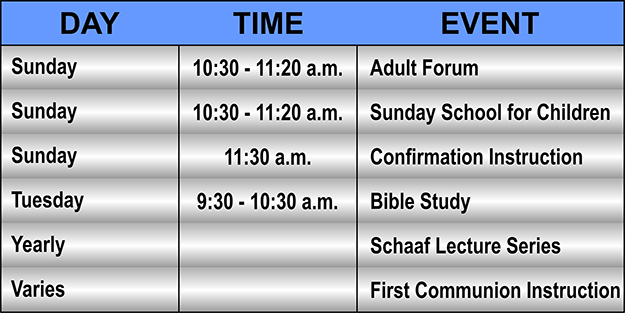 The Forum meets in the Parish Hall each Sunday from 10:30 to 11:20AM (September-May). Come for a cup of coffee and snack and enjoy thought-provoking presentations and discussions. Our weekday Bible class (now on Thursday mornings at 9:30AM) gathers in the office/education building conference room for in-depth study of the Scriptures and stimulating conversation! We have plenty of room around the table and would LOVE for you to join us! We are on summer break for the month of July. Join us when we resume on August 4. There is also a library located in the Parish Hall. Here you may check out various religious books…FREE!